Secur-Pak offers a range of products adapted and/or invented for the casino, racetrack and gaming environments. Used in chorus with our proven currency and cash management bags, Secur-Pak delivers a complete security system for loss prevention. 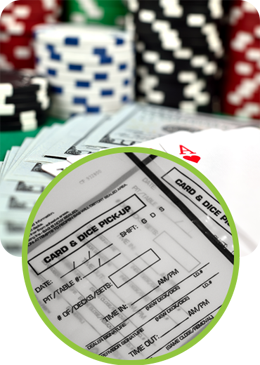 Bags designed for the convenient and secure pick up and transfer of cards and dice within a casino environment. Clear film allows you to quickly identify the number and type of contents. Write-On White Block for the recording of essential audit trail information. Allows for tracing of who packed, handled and received the bag. Permanent single adhesive closure. Seals quickly and securely without ties or heat sealers. Sequential numbering and tear off receipt for further tracking capabilities. Smaller Card Pick Up bag is specially sized and printed for use with multiple sets of dice. Smaller size and distinctive printing keep costs and confusion down. Card bags hold up to 14 full decks of cards for transport.